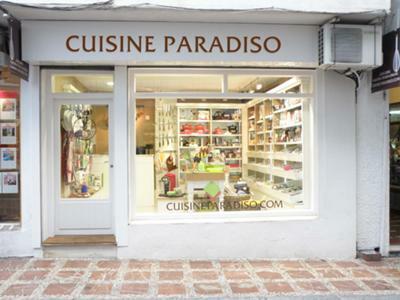 Cuisine Paradiso is the result of a love affair to food, entertaining and cooking. We are an Spanish family that has live and travelled intensively in many countrys always to come to the same conclusion of how the kitchen is the heart of a home. Everything revolves around it. When we moved back to Spain we did miss having the right tools, the fun gadgets that made cooking so much, easier and interesting. So we embarked in this delicious venture. Later on 2010 we opened our little boutique in the heart of downtown. Our web store is well develop, quite intuitive and simple to work with. Unfortunately it is not fully translated in English, our apologizes for that, we could tell you that it is because we are constantly adding new items and we barely have time for anything more that just the Spanish version, and wile that is true it is inexcusable and we know it. In exchange we offer you phone or personal support if you can by our store, we speak English and we will love to help you with any and all you kitchen needs. Come by and say hello, introduce yourself and share your best recipe with us!